At the beginning of Get Him to the Greek, Sergio (Sean Combs, aka P. Diddy), an executive at a big-time record label, is yelling at his staff, who are trying to come up with a “game changer” idea that will help the label and maybe even save the entire industry. Aaron (Jonah Hill) has a crazy thought: What if we focused on the music? After all, isn’t that why they all got into the business in the first place? It seems Aaron’s all-time favorite singer performed at L.A.’s legendary Greek Theatre 10 years earlier. Aaron thinks it would be great if they could get him back on that stage and have him revisit the site of his greatest show. Of course, the idea is dismissed. When this scene was taking place, I started to smile: Was Get Him to the Greek going to be a great commentary on the state of the music business? Ha. Don’t be so silly. But alas, even though Aaron’s idea is the one that does eventually get the boss’ approval, it’s in the service of comedy, not commentary. And as it turns out, the singer is not exactly Bruce Springsteen or anything. Instead, he’s Aldous Snow, who you may remember from Forgetting Sarah Marshall. Played again by Russell Brand, Snow is your prototypical stereotypical British rock god: he’s loud and obnoxious, he sleeps with any woman he can, and he’s either drunk or high most of the time. Sergio gives Aaron an almost impossible task: Get Snow from London to Los Angeles in 72 hours so he can do the show. Let the laughs begin. 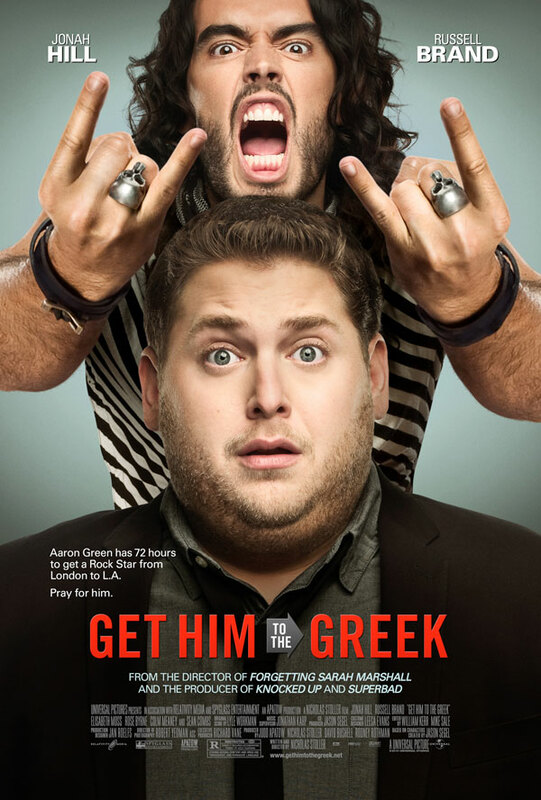 Thankfully, Greek is actually a pretty funny movie. If anything is surprising about it, it’s that most of the laughs don’t come from Brand. Instead, they’re supplied by Hill (who mostly plays the straight man) and Combs (who overacts and overemphasizes his lines, but to good effect). Writer/director Nicholas Stoller (who also directed Sarah Marshall) keeps the action moving at a good pace, and the songs sung by Snow are both catchy and amusing (and yes, totally ridiculous). In total, Greek doesn’t exactly break new ground, but it’s better than it probably should be, and I laughed quite a bit. So I’m giving it a strong B.